Dr Andre is from the Caribbean Island of Dominica. 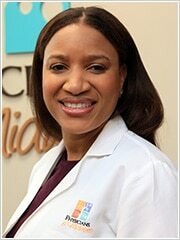 She is a graduate of Midwestern State University and earned her MD from Ross University School of Medicine in 2004. She went on to do her internship at Brookdale University Hospital in Brooklyn New York and completed her OB/GYN residency at Carilion Clinic in Roanoke Virginia. Dr Andre has a special interest in minimally invasive GYN surgery and fertility. She and her husband Kester are enjoying their move to Northern Virginia.